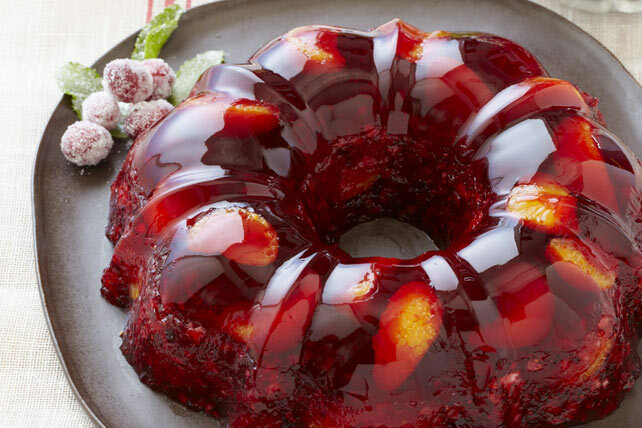 This delicious molded cranberry relish looks too pretty to eat. Mix dry jelly powders and cinnamon in medium bowl. Add boiling water; stir 2 min. until jelly powders are completely dissolved. Stir in cold water. Refrigerate 1 hour or until jelly is thickened but not set. Combine half each of the jelly and oranges; pour into 6-cup mold sprayed with cooking spray. Refrigerate 30 min. Let remaining jelly stand at room temperature until ready to use. Use pulsing action to process cranberries and sugar in food processor until berries are coarsely chopped; transfer to medium bowl. Add remaining jelly and oranges; stir until sugar is completely dissolved. Spoon over jelly layer in mold. Refrigerate 3 hours or until firm. Unmold. Refrigerate relish 3 hours or up to 24 hours or until completely firm before unmolding. Dip filled mold in warm water, just to rim, for 5 sec. Lift from water and gently pull relish from edge of mold with moistened fingers. Place moistened serving plate on top of mold. Invert mold and plate, then shake to loosen relish. Gently remove mold. If relish still doesn't unmold, return mold to warm water for another 5 sec. Stir 1/2 cup chopped toasted walnuts into cranberry mixture with the remaining jelly and oranges. Spray mold with cooking spray; arrange 1/4 of the oranges in decorative pattern on bottom of mold. Stir 1/3 of the remaining oranges into half the thickened jelly; carefully spoon over oranges in mold, being careful to not disturb or move oranges in mold. Continue as directed. Prepare using Jell-O Strawberry or Raspberry Jelly Powder.